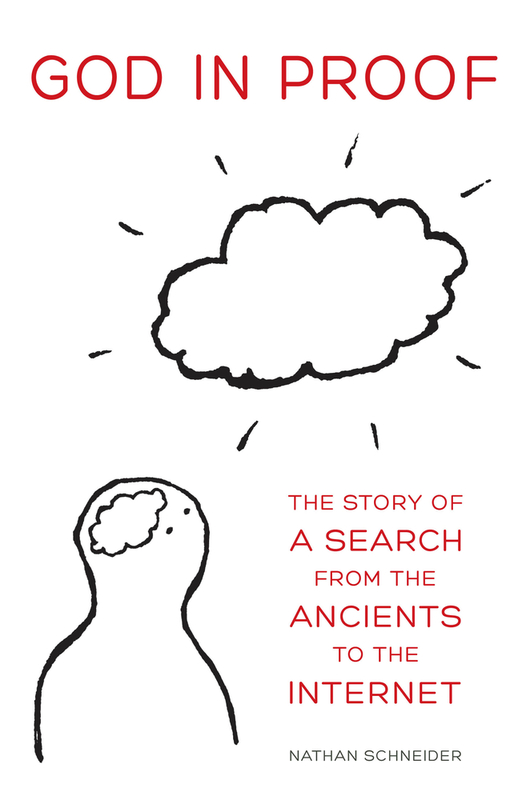 Rarely do I read a book that is so odd, and yet so completely fascinating, as Nathan Schneider’s new God in Proof: The Story of a Search from the Ancients to the Internet (Berkeley: University of California Press, 2013). Schneider, a very inquisitive and bright young man (b. 1984), comes from a truly millennial experience. His parents are divorced and they left him with a background that created a “multiple choice” paradigm when it came to religion. His mom was/is a spiritual seeker who had/has no interest in Jewish or Christian views of God. His dad is just disinterested. I was a freshman in college and had just finished a meeting with a teaching assistant. The department house’s heavy wooden door thudded shut behind me. Light; truth. A sensation flooded me with the semblance of logic, without the words to describe it or instructions to complete it. I still couldn’t even say if I believed in God or not. Yet there it was: a promissory note, at least, for propositions and definitions and conclusions to come, with the vowel-y echo in my ear of the word proof. Hurrying down the steps and across campus, past buildings standing at attention all around, I had no idea how to write my discovery down. . . . I would start to think through the steps in words and sequence but then get stuck. Stuck–that’s what I was, in more ways than one. The idea of a proof had caught me, or caught up to me. There was no turning back. After just a few months, I would be baptized a believer (italics are his, ix). Now, you must admit that this is not your usual Christian conversion story, nor a popular account of a new spiritual beginning that fits so many predictable story lines . I cannot recall the story of a student of mine, or a book that I’ve read, that begins in quite this way. A young guy without faith at all walks out of an academic building in his freshman year and feels a “promissory note” was given to him which would later be supported by “proof.” But I am already ahead of myself here. This book is, if it is anything at all, young Schneider’s story of discovery. How did the ancient Greeks, and the medieval Arabs, intellectually support their ideas of God? What about the greatest philosophers down through the ages? And more to the modern point how do Christians today respond to the attacks of atheists and anti-Christian intellectuals who seem to be on a mission to destroy what they believe to be the myth of faith, especially the Christian faith? I will say more about this book tomorrow but let me finish today by saying that Schneider does not find an ultimate proof but rather a deep confrontation between the human self and the world that allows him to become a “gifted observer of the human condition” (Kathryn Lofton). The question underlying this entire book is one that has intrigued me since I first started seeking for my own evidence of God’s existence. Since I grew up in a devout Christian home I did not begin to ask this question until I had left a secular campus in early 1969 only to run into some rather skeptical and unbelieving ex-Christians who had a background much like my own. This happened when I landed, of all places, on the campus of Wheaton College in January 1969. I had thought that this would be a place that was “safe” for preserving the faith of all Christian young people but then I did not expect to have a roommate who had walked away from the faith when I moved into my dorm during my first semester at Wheaton. This had a radical impact on me and forced me to intellectually grow up, which was (in the end) the major reason I had left Alabama to enter Wheaton in the second term of my sophomore year. There is a fine podcast about this book that is given by the author on the publishers website. You can listen to it here. Intriguing. I’ll check it out. Thanks! Sarah Gillert liked this on Facebook.